Plano, Texas has a new restaurant called Farmbyrd Rotisserie & Fry featuring responsibly sourced chicken, farm fresh sides, seasonally inspired salads, Texas beers and craft cocktails. Plano, TX, January 25, 2017 --(PR.com)-- Residents of Plano can now welcome a brand new “byrd” in town. Farmbyrd Rotisserie and Fry is now open in the Parker Preston Crossing Center located at 3308 Preston Road, Suite 380, Plano, Texas 75093. This is the first location for this new concept conceptualized by Tim McLaughlin, co-owner of Lockhart Smokehouse, and Chef Ryan Carbery along with business partner RJ Timmons. Farmbyrd is a casual neighborhood counter-service restaurant featuring responsibly sourced chicken, farm-fresh sides, seasonally inspired salads and a full bar. 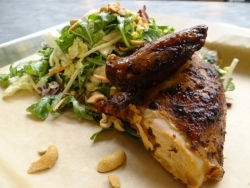 The concept is focused on creating high-quality “bryd,” offering both rotisserie and fried chicken that is thoughtfully brined, seasoned and prepared for your order. They are committed to offering farm fresh food, and use only the freshest, never frozen chickens with zero hormones or antibiotics that are sourced from responsible farms. The menu also includes an array of salads and sides with careful attention to flavor pairings and seasonality of vegetables. “Farmbyrd’s approach to our food is that ‘less is more’; we want the ingredients to speak for themselves. We source the freshest and most seasonally appropriate ingredients, to create pairings that the palette simply enjoys,” said Ryan Carbery, managing partner of Farmbyrd. Cauliflower, red quinoa, roasted corn, and Brussel sprouts are just a few of the sides that are being served up now, in addition to classic favorites like creamy mac n’ cheese, crispy fries and pork and beans. Farmbyrd was designed and decorated with a strong attention to natural elements. The space uses a lot of recycled materials and reclaimed wood in an open dining room setting. “We created a neighborhood place that customers want to come back to again and again. This isn’t a complex concept; we are focused on creating really good tasting food that is fresh and consistent and we serve it in an environment that you want to hang out in,” said Tim McLaughlin, managing partner of Farmbyrd. The restaurant also features a full bar that serves local craft drinks, Texas beers and new world wines. This is the first location for this new concept conceptualized by Tim McLaughlin, co-owner of Lockhart Smokehouse, and Chef Ryan Carbery along with business partner RJ Timmons.